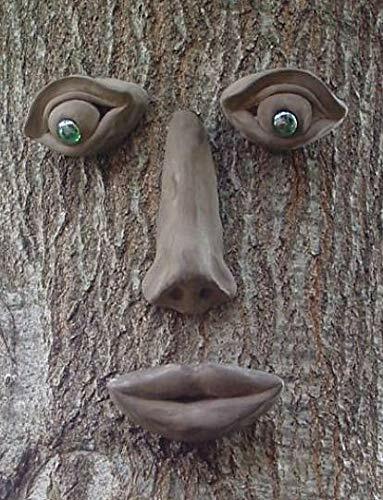 I've seen a few of these tree face decorations in our area, and they always make me laugh with delight, after my initial surprise on seeing them. We just don't expect to see trees with faces except in fantasy tales! What a fun way to add personality to your own trees, and to make them "come alive"! 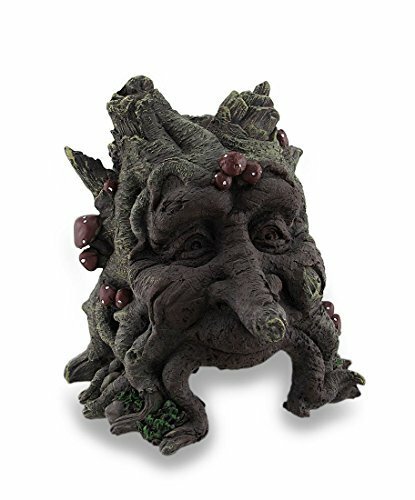 These whimsical tree faces also make great gifts for friends or family who are gardeners or nature-lovers, and who like the idea of a bit of fantasy in their lives. Make your trees "come alive"! The first time I saw one of these tree faces I did a double-take, then started laughing. What a delightful way to add extra character to a tree, and to charm passersby! These whimsical tree faces remind me a little of the talking apple trees in the Judy Garland movie Wizard of Oz, or the weirwood heart trees on HBO's Game of Thrones, but the tree faces featured here are friendlier than the Oz trees, and not as sad or grim looking as the weirwood tree faces. Who would you buy tree face decorations for? Well, first of all, if you are as tickled by these faces as I am, you might buy a tree face for one of your own trees. 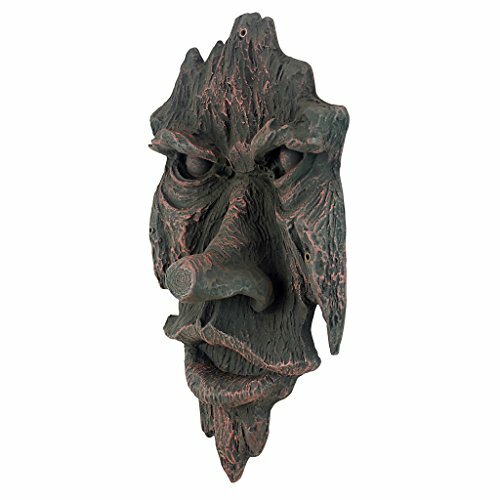 A tree face makes a great gift for anyone who likes a bit of whimsy in their lives, and who enjoys the out-of-doors. You could buy one of these as a special gift for your favorite gardener or nature lover. Do you know anyone who loves fantasy stories? I bet they'd love having a tree face to make one of their own trees "come to life"! These make great house-warming gifts too. Or Mother's Day or Father's Day gifts. Or for birthdays and other special occasions. The Genuine Tree PeepleTM (yes "Peeple") shown on this page, including Simon Tree Face (above) and Whistlin' Pete Tree Face (right) are made from a durable All-Weather Garden Stone composite of earth-toned shades. The color isn't painted on, but it goes through each piece. These faces blend in with the tree bark, and they weather well, looking even more natural over time. You can keep these tree faces up all year. 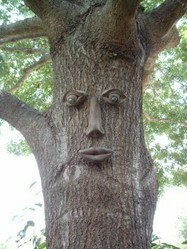 Each Tree Face comes as a kit of separate pieces - eyes, nose, and mouth - that you attach to your tree. Each piece has a wire hook on the back that you hang from a nail or small screw from your tree (you supply the nails or screws). Reviews are overwhelmingly positive for Genuine Tree PeepleTM. People said that the faces are quick and easy to install, and the pieces are durable and they hold their color. The biggest complaint I came across is that the green iridescent colored eyes sometimes fall out. The Spirit of Nottingham Woods tree face sculpture is my favorite tree face on this page. It's made from a pliable composite resin that attaches to your tree with four color-matched screws at the corners of the face. Since it's pliable, it will mold to fit any tree. The Spirit of Nottingham looks like it's an integral part of the tree, and not just an add-on. 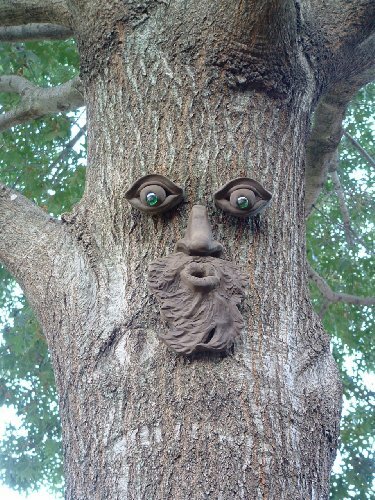 You can have a lot of fun watching people's reactions when they discover this wise old "tree spirit" in your yard! This funny craggy-faced creature looks like a cross between a warty toad and the spirit of a gnarly old tree stump. It's made out of a weather-resistant resin, so it won't decay and disintegrate like a real tree stump would over time. Set this out in your vegetable or flower garden to add a light-hearted whimsical quality to either of those spaces. And perhaps it really will attract a toad or two who will stay around and eat any pesky bugs that dare come into your garden! What's Your Favorite Tree Face? Opps forgot to add, I like the Spirit of Nottingham Woods best. Too cute. I'll take one each. Aren't these tree faces fun :-) Thanks for your comments, Angel and frugalrvers! Before we started rving, we put one of the "happier" faces on our tree at our house. When we sold it and moved away, we actually forgot it because it blended in so naturally. Ah well, let the new homeowners enjoy it! I just love these! Thanks for sharing.